I was reading my daily email from the NYT food department and there it was. The perfect confluence – the junction of two rivers – Zucchini and Ricotta. We are starting summer off with what undoubtedly will be too many zucchini in the garden, which requires me to make every zucchini recipe I can get my hands on. And then there’s ricotta. The recipe advertised a recipe for homemade ricotta. Irresistible. I have been wanting to make ricotta for months – just haven’t gotten to it and here was my chance. This recipe had my name all over it. I hunkered on down. Line a strainer with four layers of cheesecloth and set over a bowl In a large pot over medium-high heat, whisk together all ingredients until smooth. Bring to a simmer and heat until the mixture just begins to curdle. Pour the mixture into the strainer. 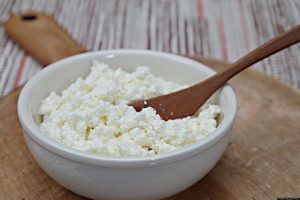 (For a drier ricotta with bigger curds, continue to simmer for 1 to 2 minutes longer until mixture completely separates). Stop draining the ricotta when the mixture begins to look like ricotta – about 5 to 15 minutes depending on how dry you like it. Transfer to an airtight container and store for up to two weeks or use right away in this recipe!! Boil water in a large pot. In a large skillet, over medium-high heat, cook the onions in 3 tbsp olive oil until soft – about 5 to 8 minutes. Reduce heat as necessary to keep onions from browning. Add zucchini, season with salt and pepper and continue cooking, stirring occasionally until soft-ish. This should take about 10 minutes. Turn off the head. Using a small food processor (or mortal and pestle), combine garlic, basil and a little salt. Stir in 3 Tbsp olive oil. Salt the pasta water and put in the pasta, stirring. Boil per package instructions but make sure to keep the pasta al dente. Drain pasta, reserving 1 cup of cooking water. Add cooked pasta to zucchini in skillet and turn to medium-high head. Add ½ cup cooking water, then the ricotta, crushed red pepper and lemon zest, stirring to distribute. Cook for a minute. Mixture should be creamy. Add a little more pasta water if necessary. Add the basil paste and half the grated cheese and stir to incorporate. Spoon pasta into warm soup plates and sprinkle with cheese.